“Physics” is the ultimate science of cause and effect. Physicists like to describe their science as the hardest of “hard science” because physics can claim to be governed by hard and fast scientific “Laws”. This of course would seem to imply that many of the so-called “soft sciences” are in some way not quite as elevated, not quite as good. In truth however we could say that physics is an “easy science”, and the soft sciences are “difficult” because the “laws” of physics only really work in the absence of “noise”, and yet the everyday world of the soft sciences is full of noise because most everything is continually battered and buffeted by “constantly changing feedback” which can generate wild “nonlinear dynamics”. In reality all dynamics have feedback (and resultant nonlinearity), it is just that some dynamics have much less feedback than others. Physics is, in a sense, the science of “dynamics with negligible feedback”, the science of “linear dynamics” — or in other words it is the science of the nonlinear stuff that can be safely “compressed” into neat linear differential equations which express neat linear “cause and effect”. In the simplest possible terms, linear dynamics are dynamics where the effect is proportional to the cause, and nonlinear dynamics are where the effect can be disproportional to the cause. Physics, it would be fair to say, has throughout its 400 year history, actively tried to steer clear of messy nonlinear dynamics, and in so doing has actively established a paradigm of linear dynamics; a linear paradigm of cause and effect. Unfortunately however nobody seems to have been paying the proper attention, and so chaos theory and complexity theory, as they stand today, are still a bit of a mishmash of concepts and don’t really have agreed upon definitions. Chaos Theory, for example, is generally associated with the relatively vague notion of the so-called “Butterfly Effect” (or as the academic community like to say “sensitivity to initial conditions”), but this association has, in my opinion, done more harm than good — for it is misguided, and its misdirection has merely served to mask the true nature of chaos. Some years after its publication, the English philosopher Herbert Spencer summarized Darwin’s theory of evolution as being the “Survival of the Fittest”, but unfortunately this description, although popular, is somewhat misleading. Evolution is not about the “Survival of the Fittest”; evolution is about the “Integration of the Optimally Adapted” (or more precisely, the optimal integration of optimally adapted diversity). More and more in the early part of this 21st century we are being made to realize the creative power of complexity dynamics and its potential for system self-integration and emergence. In some arenas such as a multicultural society, the economy, technology, the arts, and even our daily lives, self-integration and emergence is a source of great diversity and creativity; but in other areas such as financial markets, terror networks, and the global climate it can be a source of great instability and destruction. Over the last 400 years cause and effect has told us a lot about the dynamics of simple systems void of feedback, but the dynamics of complex systems alive with feedback is a subject that is becoming increasingly relevant and important to understand. 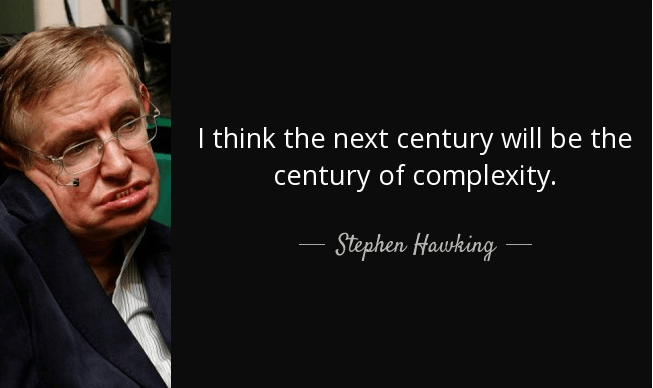 Essentially natural complexity is, in fact, “self-integrated information”. All natural complex systems are characterized by the fact that they have “low thermodynamic entropy, but high information entropy”; consequently these systems can be considered to be highly organized but unpredictable nonetheless. So while most people might think about evolution in terms of “an ecosystem of plants and animals”, the reality is that plants and animal (and the ecosystem itself) are really just “information structures”, and evolution simply keep creating evermore complex information structures (structures that are ever more difficult to mathematically compress). The new physics of the 21st century and beyond, will be the physics of self-integrating systems and accelerated evolution. Understanding this “new physics of evolution” will be essential if we want some control over our ever-increasing inter-connected, co-dependent world. Artificial Intelligence (AI) is seen by many as a means of dealing with complexity and already AI is being used to get computers to learn, but ultimately this will turn out to be really rather small potatoes; the really big pay-off will come from getting computers to explore. After studying chaos and complexity for so many years, it strikes me that the universe is not fundamentally (as it so often suggested) purely mathematical, but is more generally “algorithmic”. The process of evolution is, as Darwin himself more or less suggested, a continual process of the emergence of ever greater complexity; a process which would seem to suggests that Mother Nature is, in fact, ceaselessly executing a form of “Algorithmic Search”, constantly seeking out the most successful combinations of integrated diversity.